Are DNA-sequences which differ between humans and their next relatives involved in cognition or social behaviour? Two recent publications, approaching this topic by differing methodologies have answered this question with „yes“. Both scientific groups looked at DNA-sequences differing when comparing people with autism spectrum disorders (ASD) and a control group. And both groups observed that this group of sequences partially overlapped with sequences somehow unique to humans. The difference between the two groups refers to defining this „uniqueness“. Doan and colleagues looked at DNA-regions particularly differing in their sequence when comparing humans and their next relatives. These regions have been called „human accelerated regions“. They are strongly conserved outside Homo sapiens, but shifted in sequence information during the evolution of our species. Mutations in such regions are elevated in individuals with ASD and are connected to an increased risk for developing respective symptoms. 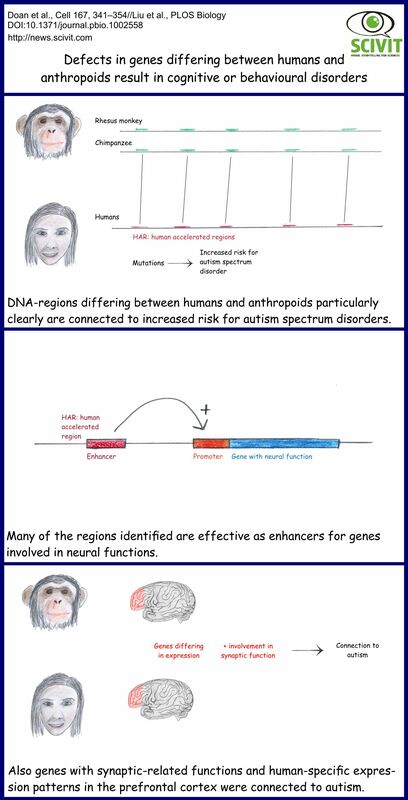 A close genetic analysis demonstrated that HARs connected to ASD work as enhancers for genes with known neural function. Liu and colleagues, on the other hand, looked at genes with human-specific expression patterns during the development of the prefrontal cortex. Samples for this analysis were taken from deceased humans (with or without ASD), chimpanzees and rhesus monkeys. They identified one group of genes connected to ASD which was differing in expression patterns between apes and humans. This set of genes also seems to be connected to synaptic functions.